Vice President M. Venkaiah Naidu on Sunday said that India is respected and regarded world over for its age-old values of peace and harmony embedded in its philosophy of Vasudhaiva Kutumbakam. 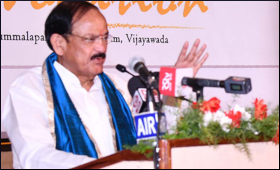 Speaking at a felicitation function organized by the committee of Friends and Well Wishers, in Hyderabad, the Vice President said that the horrific shooting of defenceless worshippers in New Zealand once again highlighted the need for all countries to come together to eliminate the scourge of terrorism. “It is a global challenge which requires a global response. No country is immune to these threats”, he added. Pointing out that India had been victim of mindless violence and facing the menace of cross-border terrorism for the past many decades, he expressed his disappointment over China’s decision to block the proposal of UN Security Council to list Jaish-e-Mohammed Chief, Azhar Mahmood as a global terrorist. “This once again underlines the need for expanding the Security Council”, he added. The Vice President wished that he would undertake a nationwide campaign to promote peace; strengthen democracy, fight corruption, create greater awareness on sustainable development and encourage social harmony through various forums across the nation. Naidu said that the quest for industrialization and modernization has pushed the atmospheric carbon dioxide to dangerous levels leading to climate disruption and global warming. Quoting the latest report of Global Environment Outlook which mentioned that poor environmental conditions were causing about 25 per cent of global diseases and mortality - around 9 million deaths in 2015 alone, the Vice President said “all of us must strive to protect environment, reduce pollution, promote greenery, conserve water bodies and ensure that development does not disrupt natural resources”. Referring to the conferment of the Honorary Doctorate, she Naidu said it was not for an individual, but reflected the global acknowledgement and recognition of the age-old Indian values of peace and harmony embedded in our philosophy of Vasudhaiva Kutumbakam.